Thousands of Palestinian protesters clashed with Israeli forces in east Jerusalem and the West Bank, demonstrators in the Gaza Strip burned U.S. flags and pictures of President Donald Trump, and a top Palestinian official said Vice President Mike Pence would not be welcome in the West Bank, in a show of rage Thursday over the American decision to recognize Jerusalem as Israel’s capital. Israeli forces were bracing for the possibility of even stronger violence on Friday, when tens of thousands of Palestinians attend weekly prayers at Jerusalem’s Al Aqsa Mosque, the city’s most sacred Islamic site. In Gaza, the supreme leader of the Hamas militant group called on Palestinians to launch a new uprising against Israel. The Palestinians were blindsided by Trump’s move to depart from decades of U.S. policy on Jerusalem and upend longstanding international assurances that the fate of the city would be determined in negotiations. The Palestinians seek east Jerusalem, captured by Israel in 1967, as their capital. Israel claims the entire city, including east Jerusalem, home to sensitive Jewish, Muslim and Christian holy sites, as its undivided capital. The opposing claims lie at the heart of the Israeli-Palestinian conflict and have often spilled over into deadly violence. The Palestinians declared three “days of rage,” shuttering schools and businesses, and staging angry demonstrations at Damascus Gate, one of the entrances to Jerusalem’s Old City, and cities across the West Bank and Gaza. “We are here. We believe in our rights and one day it (will) become Jerusalem, the capital for the Palestinian people,” declared Rania Hatem, a protester outside the Old City. The Israeli military reported demonstrations in some 30 locations across the West Bank on Thursday, saying Palestinians had hurled stones and firebombs at troops. A military official, speaking on condition of anonymity under briefing guidelines, said troops were instructed to use minimal force and avoid live fire to avoid escalating tensions. In the West Bank, troops fired water cannons and tear gas to disperse a crowd in Bethlehem, the biblical town of Jesus’ birth, just weeks before thousands of foreign tourists are expected to visit for Christmas celebrations. In Ramallah, the seat of the Palestinian government, protesters set tires on fire, sending thick plumes of black smoke over the city. Palestinian officials said dozens of protesters were slightly wounded, most from tear gas inhalation. 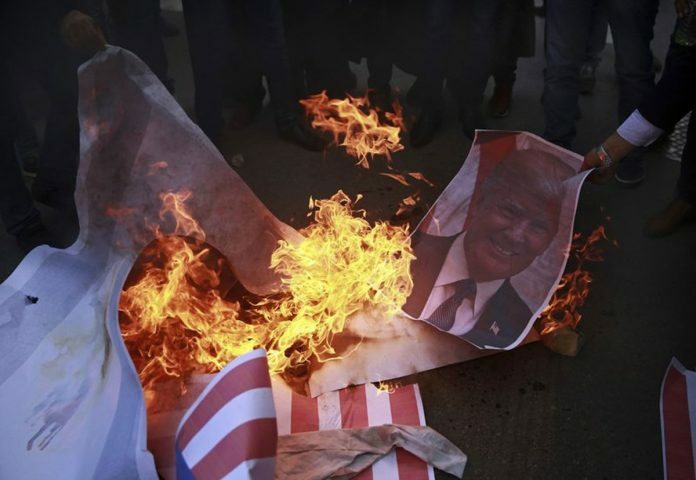 Spontaneous protests also took place in Gaza, with angry youths burning tires, American and Israeli flags and Trump posters. A senior Palestinian official said the Palestinians would not meet with Pence during his visit to the region later this month when Pence is expected to visit Israel and make a stop in the Palestinian city of Bethlehem. “We will not receive him in the Palestinian territories,” said the official, Jibril Rajoub. However, a White House official said Pence still plans to meet with Palestinian President Mahmoud Abbas as scheduled and said it would be “counterproductive” to cancel. The official spoke on condition of anonymity to discuss upcoming plans. Israeli security officials were preparing for more unrest on Friday. In a pre-emptive move, the military said it would deploy several battalions to the West Bank, while other troops were put on alert. Israeli officials said Friday prayers at the Al Aqsa Mosque, along with the expected unrest in the West Bank, would set the tone for the coming days. Palestinian officials in the West Bank said they had no interest in bloody violence but warned that individual attacks were possible. Israeli police were considering whether to impose age restrictions on worshippers at Friday’s prayers, but as of Thursday evening, had made no changes. In Gaza, Ismail Haniyeh, the Hamas supreme leader, called on Palestinians to launch a new uprising. “We want the uprising to last and continue to let Trump and the occupation regret this decision,” he said. Hamas, which seeks Israel’s destruction, killed hundreds of Israelis in suicide bombings and other attacks during the second Palestinian uprising in the early 2000s. However, the Islamic militant group, which seized control of Gaza in 2007, has been weakened by a decade-long Israeli blockade and three painful wars with Israel. Nonetheless, it still has cells in the West Bank and possesses a large arsenal of rockets in its Gaza stronghold. Late Thursday, Israeli tanks and aircraft attacked two military posts in Gaza, following a series of rocket attacks, including one that landed in southern Israel. There were no reports of casualties on either side. Trump’s decision had no immediate impact on daily life in Jerusalem, which already is the seat of Israel’s government. While Trump insisted that the move was meant to acknowledge the current reality, and not prejudge negotiations on Jerusalem’s status, it carried deep symbolic meaning and was seen by the Palestinians as siding with Israel. And even if Trump’s move cannot singlehandedly determine Jerusalem’s status, policies of the U.S., the lead mediator for over two decades of unsuccessful peace talks, carry special weight. Israeli Prime Minister Benjamin Netanyahu said Trump “bound himself forever” to the history of Jerusalem and maintained other countries were already interested in following suit. The king could play an important role. He is one of Washington’s most dependable partners in the battle against Islamic extremism in the region, and his country is the custodian of Muslim holy sites in Jerusalem, making him an influential player. Abbas said he was also speaking to countries in Europe and Africa. International opposition has been widespread, including America’s closest allies in Europe. “Fortunately, there was a positive response from all the countries in the world,” Abbas said. On Thursday, the Palestinians asked the Security Council to take urgent action and demand that Trump’s decision be rescinded. The council scheduled an emergency meeting on Friday. Meanwhile, anger at the U.S. rippled across the Arab world. The Arab League, which represents most states in the Middle East and North Africa, was to meet Saturday. Next week, Turkey will host a gathering of the Organization of Islamic Cooperation, which has 57 Arab and Muslim member states. Despite the verbal support, Palestinian officials are concerned the Arabs will not provide the sustained backing Abbas needs. While quick to condemn Trump’s decision, Arab leaders have not threatened to reduce ties or take any other action against the U.S. or Israel. There were also feelings of resignation from many in the region who said they have long given up on their leaders standing up to either Israel or the United States. Preoccupied with their own tribulations, there were barely any protests in capitals like Beirut, Baghdad or Damascus. Palestinians protest Trump move, more unrest feared. Israeli forces are bracing for even stronger violence. US flags burned in Gaza Strip in a show of rage.